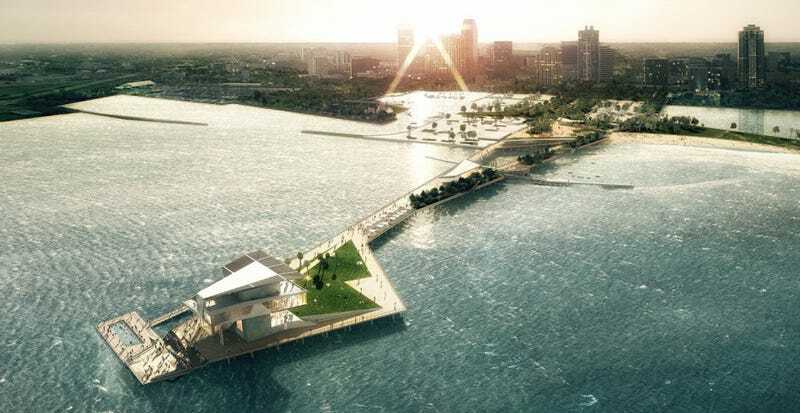 St. Petersburg’s proposed pier by Rogers Partners Architects+Urban Designers, Ken Smith Landscape Architect and ASD. There’s no polite way to put this: Florida is screwed. And we’re starting to see the state’s infrastructure adapt to the reality of climate change. A new pier for St. Petersburg just been approved by the city that takes changing ocean conditions into consideration. This includes a lightweight structure that can float on rising seas and smart engineering that’s resilient in the face of potentially more powerful storms. Several St. Petersburg piers have graced Tampa Bay, with the most recent “Inverted Pyramid” design opening in 1973. It was a typical pier, with a boardwalk and tourist-friendly diversions. But maintenance on the pier was proving to be too expensive, and in the early 2000s, the city began exploring new alternatives. After a long and controversial process, including several rejected designs, construction on the new pier will begin next year. In many ways the design by Rogers Partners Architects+Urban Designers, Ken Smith Landscape Architect and ASD takes the original pyramid form and adapts it for Florida’s reality: The new angular pier tower shields visitors from the hot sun and bears the brunt of any offshore weather. But if you look closely, the pier is built more like a house on stilts. Most of the pier is made up of a large lawn for programming that doesn’t require much maintenance and can be battered by high tides. Any amenities like restaurants, for example, are placed higher in the tower. And most of the pier itself, including a “wet” classroom for students and a fishing deck, will float. The estimate from the US Army Corps of Engineers says that sea levels in St. Petersburg will rise 3.2 feet by 2100. St. Petersburg is going through an exercise that many other oceanfront cities will be facing soon. Miami Beach, for example, is looking at long-term solutions that incorporate the already-rising ocean into the city, more like the canals of Venice, Italy. It’s not just about the construction of defensive infrastructure like seawalls and barrier islands. It’s about designing structures which are beautiful today, yet can be flexible in the face of an uncertain future.